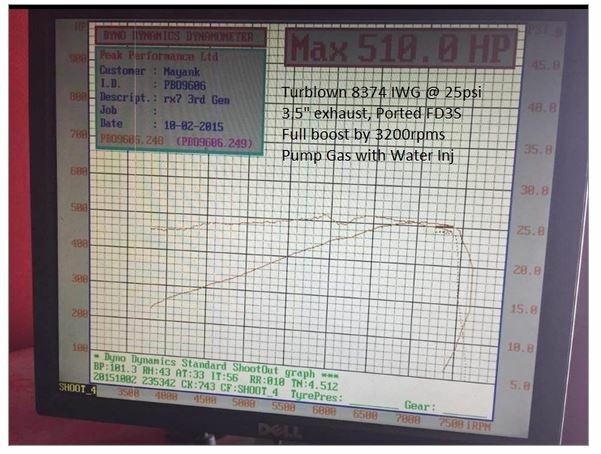 Turblown Engineering was the first shop to developed a BorgWarner EFR IWG Turbo system for Mazda Rx7 back in Nov of 2013. This blog post will cover the turbo system in depth, the updated cast manifold, dyno results, and help you select the correct size EFR for your Mazda rotary. A separate article here covers IWG VS EWG. If you are looking for the least amount of turbo lag, look no further, no one has ever developed a kit that comes even close. The combination of the following completely transforms the typical 2 stroke power-band of a 2 rotor engine. Generally the EFR 7670makes 15 psi by 2500rpms, and the EFR 8374 makes 15 psi by 3200rpms. E85 will reduce the lag by 10%, and same goes for each half inch bigger size of exhaust system. An 8374 car on E85 with a 3.5" exhaust will make 15 psi by 2800rpms for example( 400rpms faster than a 3" exhaust pump gas setup). These results are not only faster than the stock twins, but provide a LOT more power everywhere. At high boost pressures you would swear there was a 20B under your hood. One can achieve over 300 ft lbs of torque by 3k rpms, and 450 ft lbs by as low as 4300rpms while still holding the traditional high HP top end power of a rotary engine. Reliability, service life and simplicity are key factors when choosing a single turbo kit, especially if it will be track driven. We have yet to see an EFR turbocharger fail, even after road course racing an EFR 8374 FD3S at 31psi for well over two years. The EFR turbochargers have 2 shaft seals per wheel, where as most turbochargers only have one. This lessens the chance of oil seal leakage from too high of oil pressure, crankcase vent issues, and wear. The ceramic dual ball bearings are more durable at high thrust loads found compared to journal bearing turbochargers. The EFR turbine housings are investment cast high nickel stainless steel. Turbine housings made of cast iron, even with nickel added fail over time, especially on a rotary with a T4 divided housing. The EFR turbine housing material was made specifically to be crack resistant. Wastegate diaphragms are a wear item when using an External WasteGate(EWG) turbo system. The diaphgram on a external wastegate is within inches of the exhaust heat. This puts considerable wear on them, and its very common for them to fail on a roadcourse driven Rx7s. The IWG option removes a lot of this issue. The diaphgram is 7+ inches away from the exhaust system, connected to the compressor cover. Not to mention the wastegate lines are also far away from heat too. If a wastegate line melts, the wastegate will not open and the boost pressure will usually result in an engine failure. A very common failure spot of most turbo systems is the turbo manifold. Turblown's new cast manifold is made from 347SS which is far superior to 304SS. Not only does 347SS last longer at elevated temperatures, but there are no welds like those found in traditional turbo manifolds When a welded turbo manifolds fails, they almost always break at or next to the welds. A broken turbo manifold even if it features a life-time warranty can be a serious hassle to remove and send back in for repair, especially if you miss a race because of it. With over 300 in circulation and 3 years of use, we have yet to see a single failure on one of these. The turbo system also comes with an inconel T4 gasket, and inconel studs and nuts. Inconel is far superior to mild steel or 300 series stainless found in your standard turbo hardware. The oil feed & coolant feed/return lines are hard-lined near the turbo system. This prevents failure of rubber components that are only rated to 300 deg F sitting near your 1600+ Deg F turbine housing and turbo manifold. The down-pipe is this kit is mandrel bent to reduce the amount of possible failure points; the welds. Optional Inconel Heat Shield Enclosures are available at extra cost. This system is quite a package all wrapped up inside the EFR. The IWG eliminates dual external waste-gate cost and failure points; diaphragms & hoses close to heat, wastegate runner welds, and leak prone vband flanges. It also eliminates the rats nest of exhaust plumbing when you want to recirculate twin wastegates back into your downpipe. Not only is this expensive, but its tricky to get correct, and you are adding a lot more heat generating surface area to your engine bay. The compressor cover's built in CRV( compressor re circulation valve) eliminates the need to buy an install an external BOV. The compressor cover also has a built in BCSV( Boost control solenoid valve) so you don't need to buy an extra valve if you're ECU has a built in controller like the Adaptronic models. All of these features in the EFR not only save money when looking at the system as a complete package, but make it very compact and simple. First lets talk about what you have to gain over your more standard turbo Rx7 single turbo systems. This graph above is from Lucky7Racing's FC3S Roadcourse Rx7. The blue lines represent their old turbo system( 6265 BB T4 .84, Cast Greddy FC manifold, 3" exhaust system), and the red represent a EFR 7670 T4 .92 IWG, Turblown IWG Manifold, and a 3.5" exhaust upgrade. Now while this is not an apples to apples it does show an amazing change to the powerband. 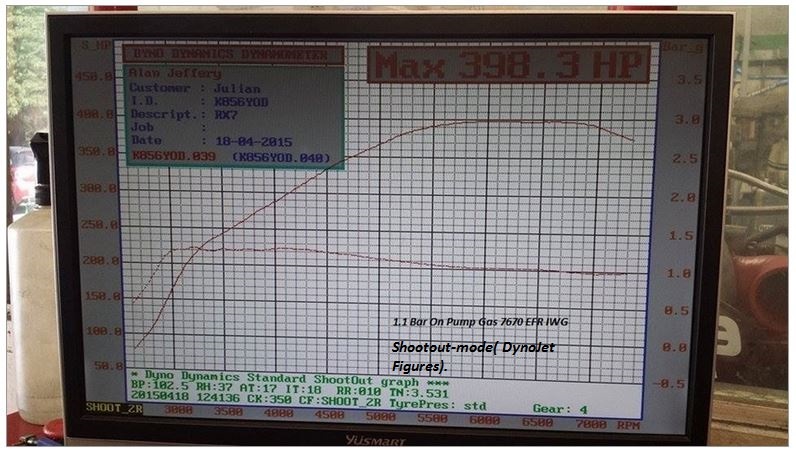 The boost was later turned up to make 446rwhp at a peak pressure of 20psi. The torque was doubled at 4K rpms by the EFR kit's ability to run 2x the boost pressure( 26psi). We spoke earlier about how this turbo system can transform your powerband and make the car feel like it has a 20B. There is no longer a reason to use the stock twins on an FD3S, or the stock turbocharger on an FC3S because you don't want to lose response. This system blows the stock FD twins out of the water! Here you can see our original test mule make 28 psi by 3400rpms above/left. 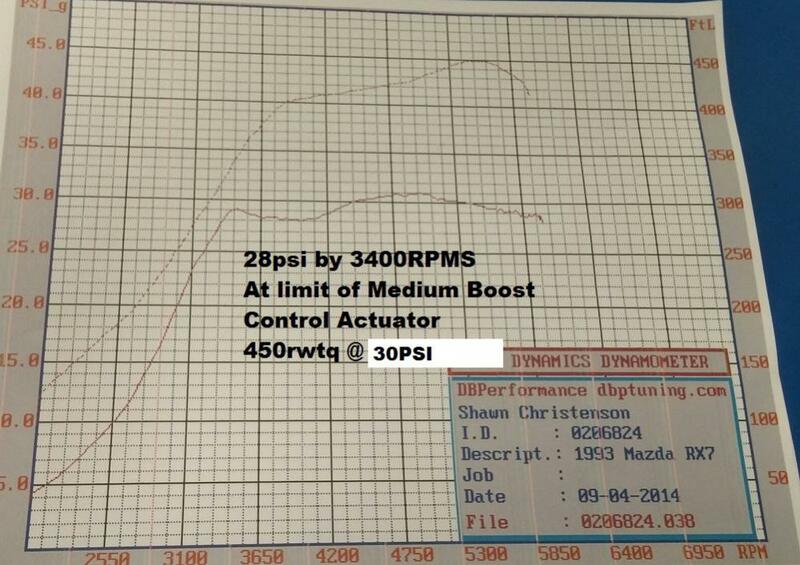 At 3200rpms it is making 300RWTQ, and 400RWTQ by 3850RPMS on an 8374 IWG( stock port engine, E85 with 3.5" exhaust). 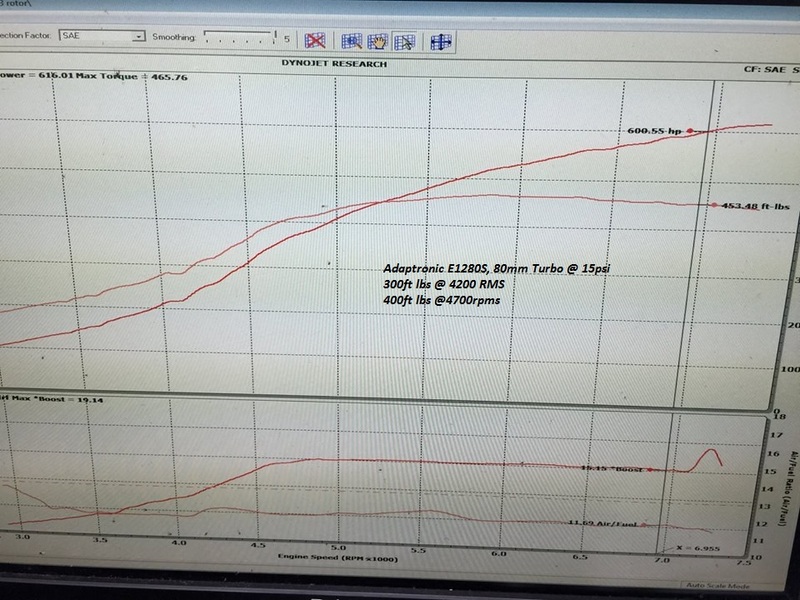 The 80mm T4 20B dyno sheet on the right shows the engine making 300ft lbs at 4200rpms, and 400ft lbs at 4700rpms. A smaller turbo 20B, something like a 67-68mm, would make these figures 1000RPMS faster generally. Now a 20B with an EFR 9180 at 20 to 30 psi would blow this 2 rotor out of the water, but the comparison is to show how one can achieve 20B or V8 like grunt with this kit at high boost pressures. EFR 7670 T4 .92 ; 64LB max flow, 57mm inducer, and 70mm turbine wheel . This is the smallest EFR that will work on a 2 rotor and to make a comparison to other brands it would be considered a 5761. This is the ideal size for a peak power of 300 to 400rwhp for a street driven or autoX car . It can make 450+rwhp but this requires 20+ psi on the top end. This turbo packs the biggest punch of any of the turbochargers below 3k RPMS, and can make 400+ft lbs of torque between 4 and 5k rpms at 25+psi. If you intend to spend a lot of time past 7000rpms you should move up to the EFR 8374 turbocharger. A typical setup for pump gas with a 3" exhaust at 16 psi is shown above. EFR 8374 T4 .92 has a 79LB max flow, 62mm compressor inducer, and 74mm turbine wheel. In common turbo sizing this would be referred to as a 6265. Genearlly one should not use this turbocharger for power levels below 400rwhp where the EFR 7670 can outshine it. It is the ideal size for the 450 to 550rwhp. We have made 600rwhp on E85 with a fully built half bridge port engine and a 4" exhaust on the 8374 cast kit. If you're engine is ported or the car is road course raced on long winded tracks this turbocharger flows much better past 6500rpms compared to the EFR 7670. It does have slightly less response below 3k rpms, but it packs a much bigger midrange and top end power, especially if you intend to run more boost pressure. Keep in mind that the downside to the 8374 or larger IWG turbos is they won't hold low boost pressures if you have a free flowing exhaust. Typically an 8374 IWG will hold no less than 13 psi with a full 3" exhaust system, and 15-17 psi with a 3.5" exhaust. We have discovered that major porting to the turbine housing will reduce boost creep by 5 psi. EFR 9180 T4 .92 has 94LB max flow 68mm compressor inducer and 80mm turbine wheel. This turbocharger is the largest EFR, and should not be selected for anything under 500rwhp for any condition. In common turbo size selection this turbo would be referred to as a 6874. The boost response is unheard of on a turbo of this frame; it can make 20psi by 3k rpms, and 30 plus psi by 4krpms on a 2 rotor. This turbocharger should be selecting for the 550 to 630+rwhp range, for a very high powered street car, long winded road-course or drag car. It is the ideal EFR for a 20B that is not looking for over 600rwhp. We have yet to test the IWG on a 20B extensively, ( 1.0 vband inlet, and 1.45 also available in EWG). We will update this blog soon with IWG 9180 DynoCharts. The EWG 1.05 9180 has been proven to make 800rwhp. One should use the optional EFR shaft speed sensor if running high boost pressures to make sure it this turbo never exceeds 128,000 RPMS or early failure will result. The Borgwarner EFR IWG turbochargers come out of the box with the medium actuator canister. Most users have been able to report holding between 10 and 11 psi as their lowest PEAK boost pressure with a 3" exhaust. Lucky7Racing reported their car would hold 10 psi straight off the wastegate with a full 3.5" exhaust on the 7670 model. A Catalytic converter or smaller cat back will allow as low as 7 psi with this actuator. The low boost actuator should never be installed in our opinion. We have learned that at the standard out of the box and recommended base preload of 3 full turns yields about 16psi peak PSI in the higher RPMS with the OE BW boost control solenoid near max duty cycle(with a 3" exhaust). 3.5" and bigger are showing 18+ psi. High Boost only applications( 25+psi) should use the high boost EFR actuator, or better yet the new Turbosmart Dual Port IWG actuator. The Dual port allows one to run both high(30+) and low settings, while the high boost BW solenoid only allows high boost. The rod length on the EFR IWG can be adjusted to provide more preload, and therefore more spring pressure. More preload results in snappier low boost, less chance of premature opening of the WG, and higher boost pressures overall. Our test car runs 7 turns of preload to deliver as much as 31 psi by 3400rpms. The bottom line is if you are going to run pump gas only, chances are the BW parts will work fine for you. If you want to run high boost you might have to fine tune the preload, and upgrade your actuator. We highly recommend using an electronic boost controller regardless, it will allow one to get as close to the surge line as possible, and produce the maximum power per RPM point as possible.